At Hauser and Jefferson today, Vernadine Burke and Margaret Goesman, both 16, sank up to their ankles in the burning peat that was combusting merrily away beneath the surface. In trying to extricate themselves, the horrified girls also scorched their hands. They were treated at Receiving Hospital and released. At the Biltmore, manager and VP James Woods was deftly fending off the insistent demands of Captain J.M. Burman, mariner, aviator and San Pedro resident, that the hotel back his scheme to fly from Japan to Los Angeles with his pet baboon as his co-pilot. Burman states he is ideally suited for such a flight because he knows all the Pacific mountain peaks by which he and his monkey pal would steer. And in Venice, Mrs. Anna E. Van Skike was planning to celebrate her 67th birthday with a 25-mile swim from Point Dume back to her home shore, in recognition of the good health that regular swimming has brought her. 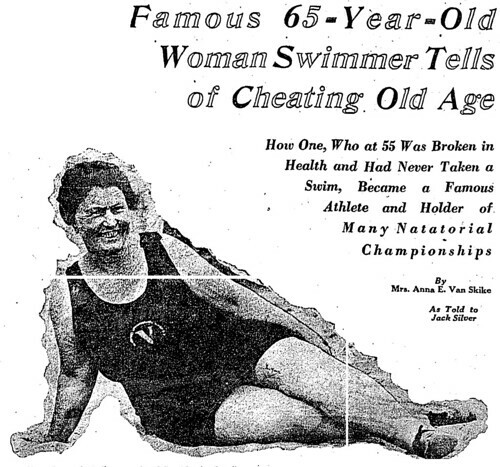 Her doctors declared she had tuberculosis at 55 and would surely die, but swimming chased the lung blots away for the Oklahoma native. Hundreds turned out in 1924 to watch the lady dive off the Venice pier, swim ten miles along the shore and sing the "Star Spangled Banner" from the waves on her return. This is Van Skike’s seventh birthday distance swim, and her longest, and will be done with the support, encouragement and liberal doses of hot coffee from lifeguards Slert and Kinney, who will row their boat in the wake of the olive oil-coated "aged mermaid." She’ll begin the feat at 2am and hopes to be home in time for dinner, though she often quips she would "rather swim than eat" and avoids fried food and pastry for their waterlogging effects. She prefers the pre-dawn hours for her feats, as the water is calmer then, and she is subject to seasickness in heavy surf. She has founded a distance swimming club, and recommends the activity to all.